Confusing mobile plan - 'unlimited' calls must be 2 minutes or less? I'm looking at the Critical Information Summary for the 12-month mobile contracts. 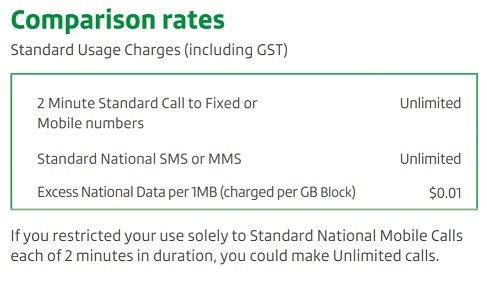 "Standard excess call rate (charged per minute): Unlimited"
"Unlimited national calls and text"
"Excess National Voice Calls to PSTN, Mobile and 13/1300 Numbers: Free"
So what's going on? What does it mean by "comparison rates"? Do these plans have unlimited call times for standard mobile calls or not? If "excess" charges are free, then that would mean calls that exceed 2 minutes are free. It's confusing. Apologize for the inconvenience with regards to this. All our unlimited call plans are “ unlimited “ and will not be charged for any excess usage. We have escalated your concerns to our management in order to get this rectified.